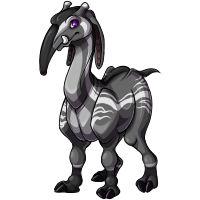 The Tapulu is a strange looking Verpet. 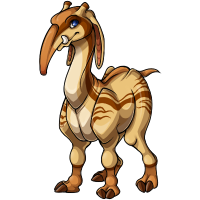 It has long floppy ears, stubby tusks, short velvet covered horns, and a long prehensile nose. They are patterned in bold stripes and sport sharp hip bones and a short tail. Their hooves are cleft, the bottoms of their feet being covered in a soft fleshy velvet. Tapulu are social animals, preferring to live in small family groups. They are intelligent, and have been seen to solve simple puzzles with their nose. Though often silent, when threatened they can let out a deep bellowing call that can echo for miles. They are slow and lazy though, prefer to spend the day grazing. They migrate often, and don't seem to like to stay in one place at a time. Once domesticated, they make loyal, hardy pets that are easily tamed, and can be used to hauling heavy loads or even riding. They are often found in underground oasis locations in the cave. There they are often found grazing and resting within the thick underground ferns and grass.